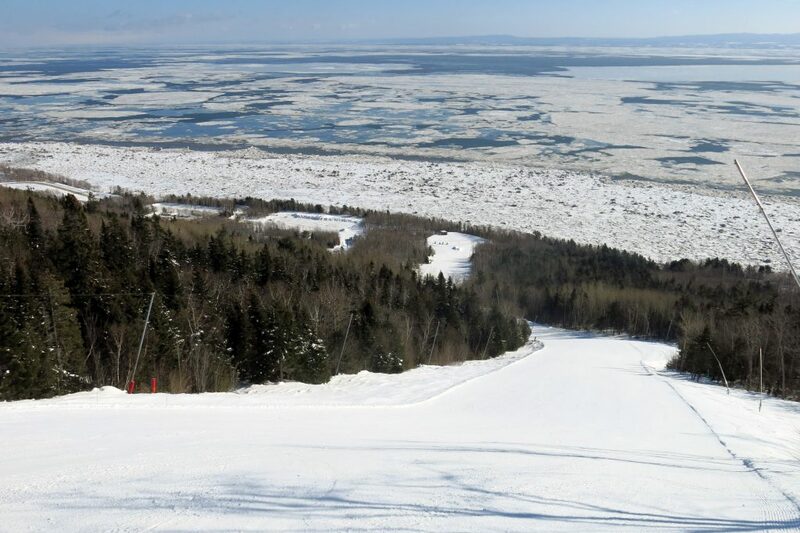 Le Massif de Charlevoix is the lowest elevation (118 ft at the base) of any ski resort on our list, located in Eastern Quebec on the St. Lawrence River right about where the river turns into salt water in the Gulf of St. Lawrence. 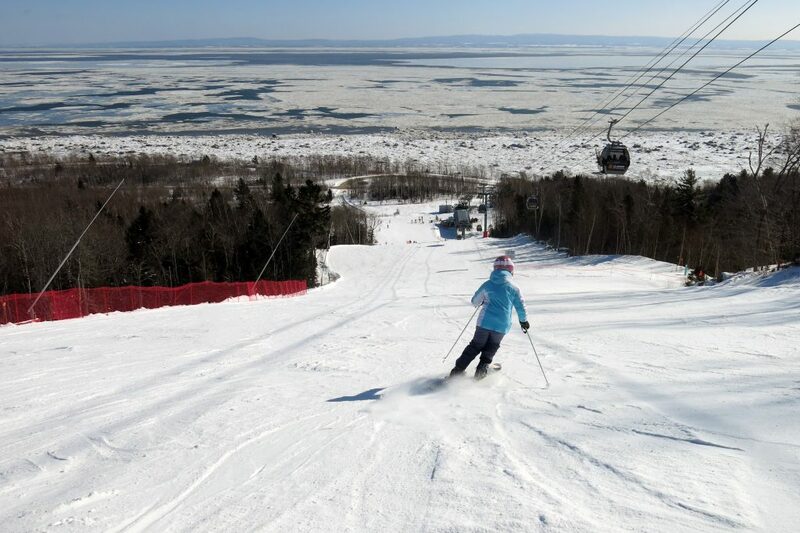 Out of the 3 Quebec resorts on our list, we think that this is by far the best one. Le Massif was one of the most unique and interesting ski resorts that we visited on our quest. We arrived at the top of the resort to a huge flat parking lot with no sign that there was actually over 2,500 vertical feet of mountain to ski below us. The drive from Quebec City is a reasonable 48 miles which takes about an hour, and the 2nd half of it is a scenic climb up to the top of the Massif. We were there on a weekday when they only run 3 of the 4 main lifts, but that wasn’t a problem because there weren’t that many people and the lift that wasn’t running (Maillard Express) doesn’t really serve any terrain that the others don’t. The lift network is all high-speed lifts and this makes a huge difference in the quality of the experience. We spent most of our time on the Grande-Pointe Express which is a bottom-to-top affair that serves most of the 2,526 ft of vertical. 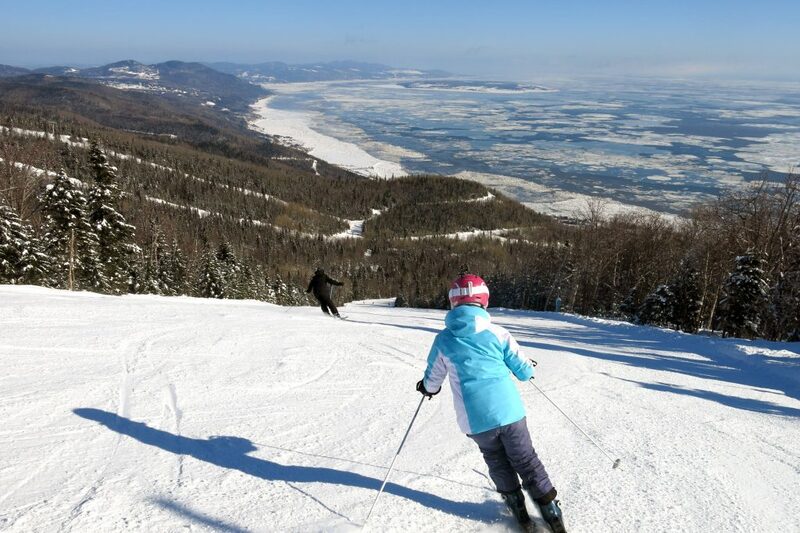 It also favors the steeper terrain on the south side of the resort where we found our favorite runs La Fénomène and the lower part of La Charlevoix. 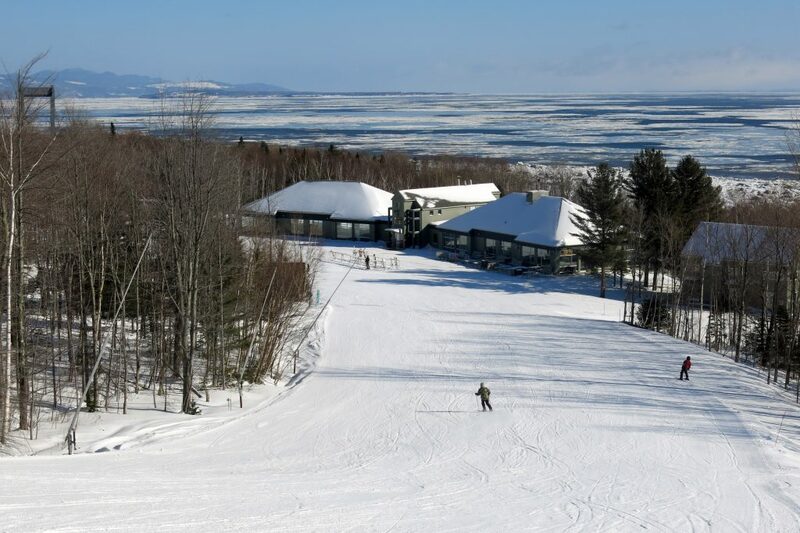 The upper part of La Charlevoix is rated TRIPLE black diamond and is never groomed. The conditions when we were there didn’t allow for skiing any ungroomed because it had lightly rained and frozen a couple of days before, but we definitely would have liked to take the whole thing from the top because it didn’t look that hard when the conditions are good. Instead we took lap after lap of steep black groomers which is where this place really shines. 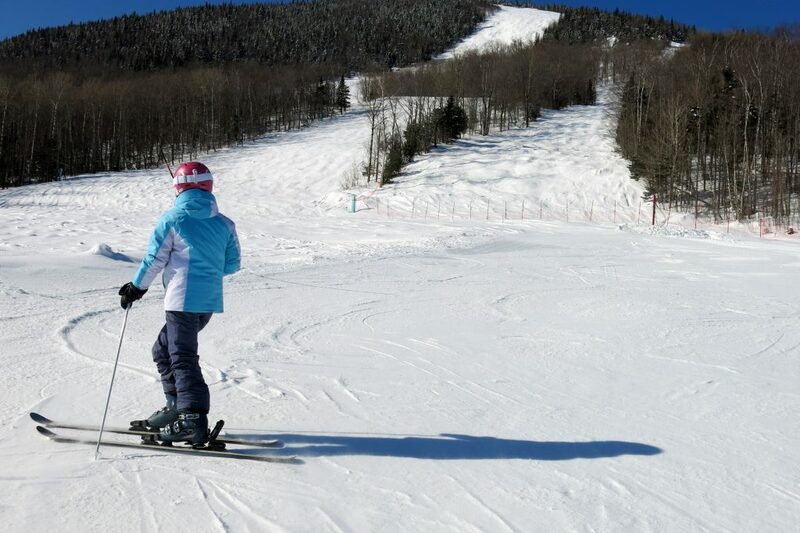 The snow conditions on the groomed runs were fantastic, with very little ice. 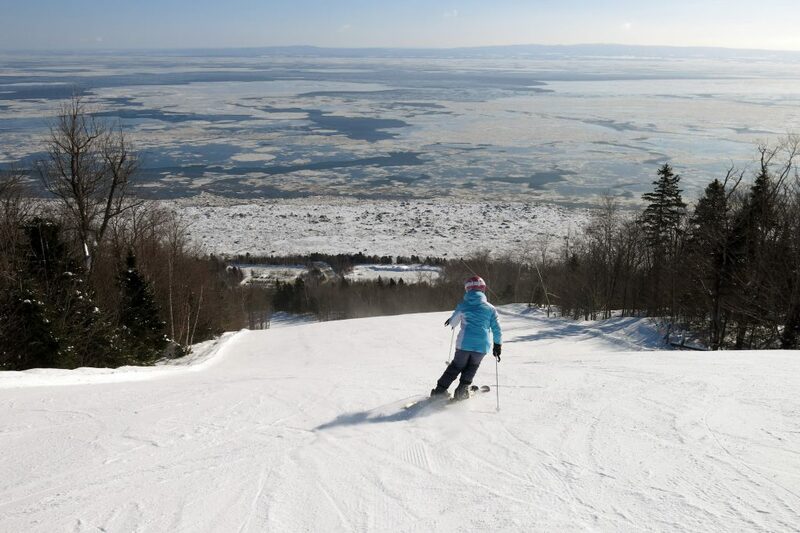 Le Massif gets a lot more snow than any of the other Quebec resorts and it shows with very few thin spots and none of that boilerplate clear ice we found elsewhere. The grooming is top notch and they groom more than half of the terrain nightly. There are some gladed areas and some completely natural forest that is skiable when the conditions are good. The next lift to the north is the Gondola “Massif Express” which has 2 loading stations. 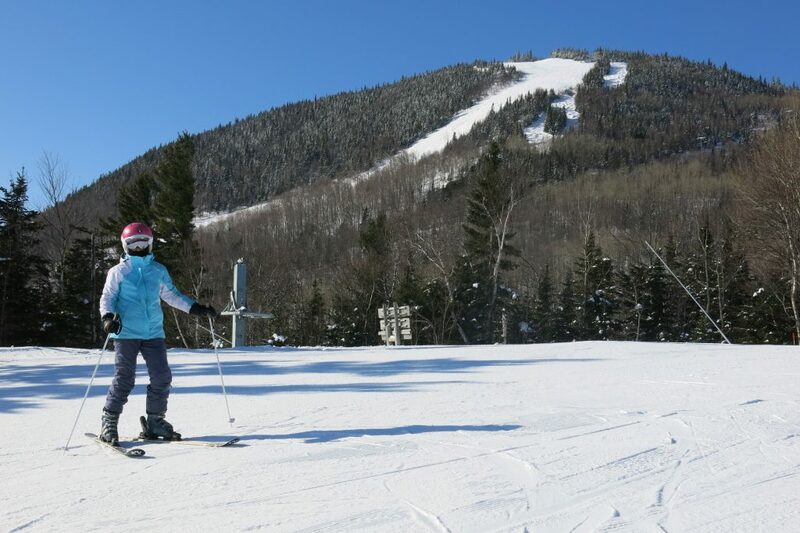 This is popular terrain — especially on a day like we had with a high temperature in the low teens. We avoid gondolas when possible but we did ski all the groomed runs in that pod which were really long and interesting with twists and turns. 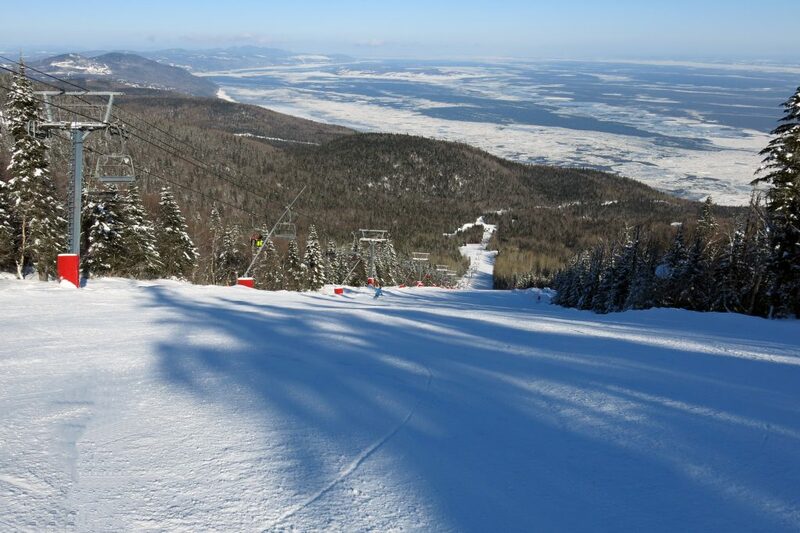 La Petite-Rivière is on of the best long groomed intermediate runs we have ever skied with a relentless drop looking at the huge river below. The only restaurant that is open midweek is the summit lodge and it was packed. Quebecois like to eat right at noon and head back out right at 1PM so by 1:15 there were plenty of spots, but it was hard to find a place to sit at 12:30. On busier weeks they should consider opening the base lodge for food service, but that was our only complaint about the way Le Massif is run. The food was the more typical excellent Quebec food that we found in most places other than Mont-Sainte-Anne, and not very expensive. After lunch we finished up our tour by skiing the Camp-Boule Express which is almost entirely intermediate runs and less than the full vertical. 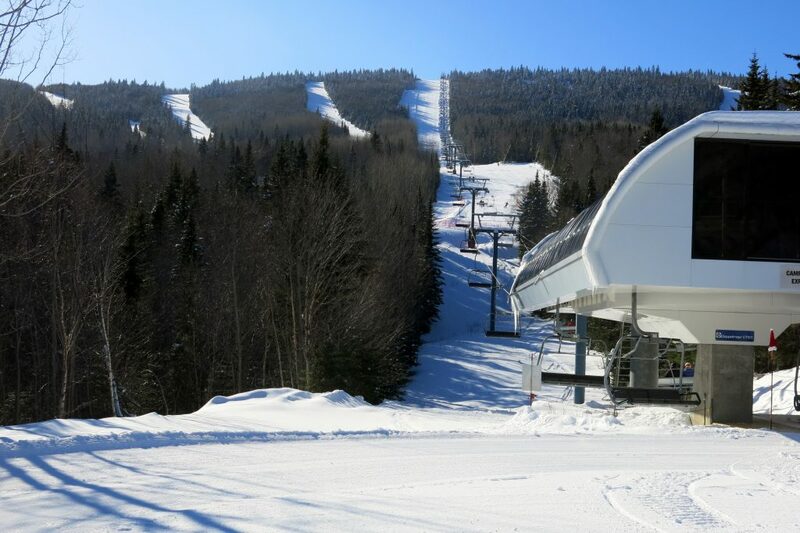 We were able to ski all of the blue runs in that pod because they were all groomed. The aspect is more north facing on that pod and it has the best snow quality but does feel very cold. 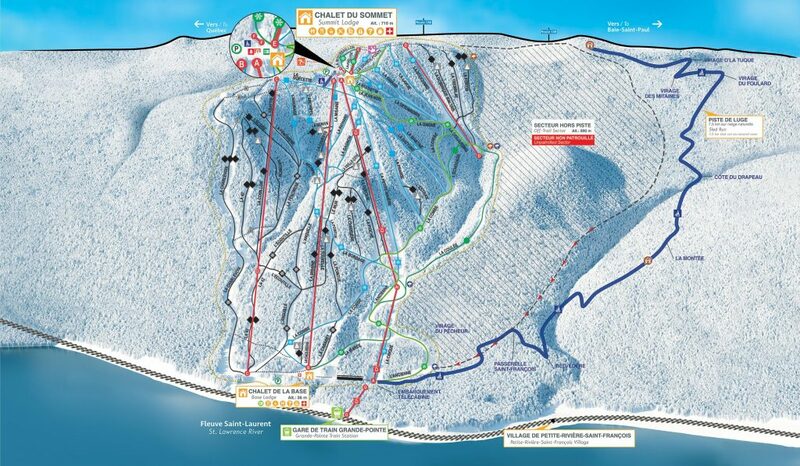 The rest of the resort faces east which is much better than the more typical south aspect that the popular terrain at Mont-Tremblant and Mont-Sainte-Anne have. 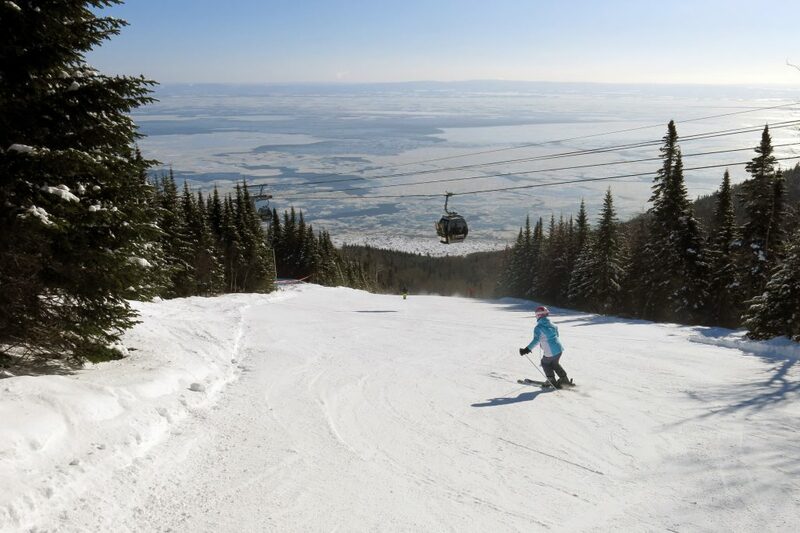 It’s always a trade-off between good snow and comfort in Quebec and it seems like most people prefer to ski in the hazy sun where it’s marginally warmer. 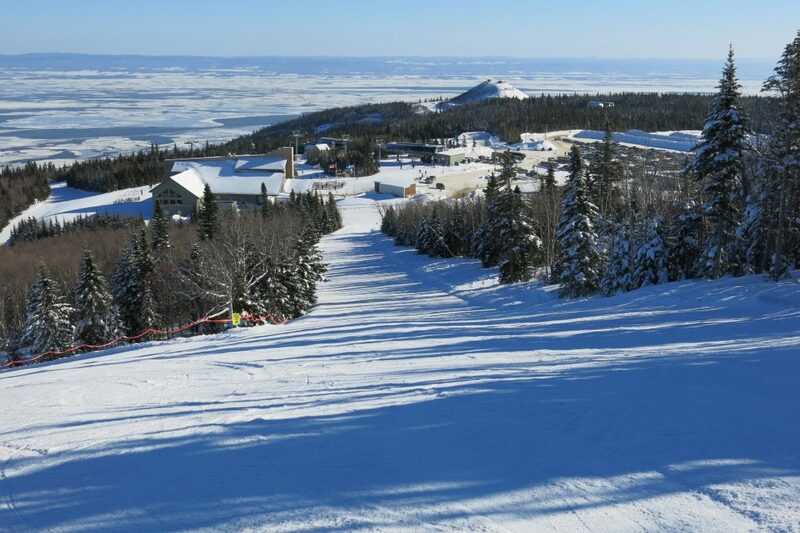 This is the best ski resort that we visited in Quebec and probably one of the best in Eastern North America. There has been a large investment in this place and it shows with great lifts, grooming, and snowmaking. They are trying hard to attract destination skiers according to locals we spoke with and it shows.